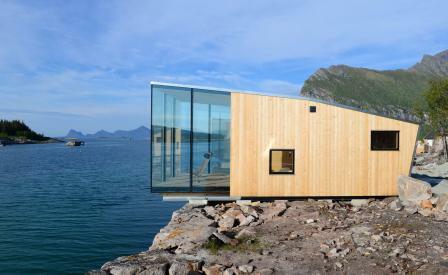 Manshausen, the wild 55-acre island that sits within a protected archipelago in northern Norway, has acquired a sleek new retreat. Owned by the celebrated Norwegian polar explorer, Børge Ousland, the hotel’s four cabins are faultlessly perched on a series of listed old stone jetties on the quayside, with sweeping views of the island’s rugged landscape and beyond. Conceived by Tromsø-based architect Snorre Stinessen, the lodging’s are a modern take on the traditional Norwegian country cabin, fronted by floor-to-ceiling glass, ensuring guests optimum immersion in the area’s idyllic surroundings. Inside, along with four beds, a bathroom and a Corian kitchen, each hut is laid out in a modular style with multifunctional features that includes walls that flip down to form tables. At the heart of the resort, is the Bødtkerboligen, a two-storey main house, which dating back to the 1800s, has been gently upgraded to incorporate a dining area and a library. Not to forget the all important spa area, which including a sauna, is due for completion in Summer 2016. Stock up on necessities in the closest town of Nordskot – two minutes away by speedboat – before hunkering down in remote bliss, with outdoor activities such as diving, climbing or fishing to keep you occupied.